Cdn $70.00 +Kit fee: $30.00, payable to the instructor the day of the class. 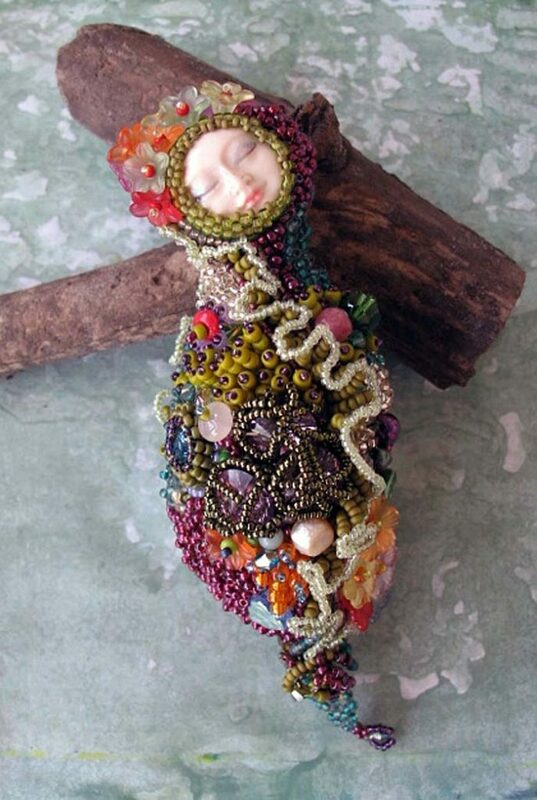 Course outline: Add a little whimsy to your life, by joining me in my latest creative adventure, beading a small art doll! I’ll provide the face, the stuffed form, and detailed instructions, all you’ll need to do is add her unique personality. Your choice of beads and techniques, will transform your doll, into the muse of your dreams. Listen carefully to her whispers, and she’ll tell you how to proceed. Possible themes include, but are not limited to the sea, nature, buttons, steam punk, vintage and memorabilia. Suitable for hoarding, collecting, or gift giving! Students should be prepared to laugh, relax and have fun! Think of it as a play date for adults! Trading and sharing will be strongly encouraged! Your neighbour just might have the perfect finishing touch for your piece. The reverse is also true. Bring to class: Regular sewing kit (sharp scissors, needle, thread), your favourite beading needles and thread, needle threader and magnification (if needed), marking pencil/pen, beads, crystals, memorabilia, collected or found objects. Including, but not limited to buttons, keys, small rusty items and old jewellery bits. Note: As this is a full day class, please bring a lunch. Coffee, tea and cold drinks will be provided. $30.00, payable to the instructor the day of the class. Pre-stuffed, felt doll form (wool/rayon mix), with a pre-attached polymer clay face. The instructor will also provide needles, curved and straight), and a limited selection of seed beads and various other beads, to share during the class. Bead embroidery of this type is very personal so plan to bring along your own collection. Written instruction, including patterns for various doll forms (including the one you're working), on will also be provided by the instructor. There will be a selection of faces and forms to choose from.